I LOVED this app on my Droid. I used it for all kinds of list making because it works better than all the list apps. Now I have an iPhone and it’s not available. So bummed. Hi Mary, thank you for your feedback. 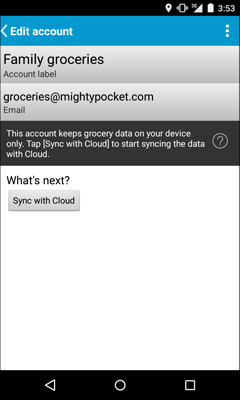 I am sad that we don’t have Mighty Grocery available for iOS yet. Hopefully it will be available early next year. Is there somewhere on the website where I could add/ edit my grocery lists? That is what I was really looking for when I saw I was able to sync with this android app. Thanks. Hi Michelle, thank you for your interest in our app and your question. Yes, you may want to try our Basic Web UI to modify your shared shopping lists. Link and invitation code are available on our Twitter. I have purchased the app for two devices and one (owner) went swimming and so i lost my data. what do you know? I also lost my password (probably didn’t select one of my regulars because it’s groceries right?). Is there a way to get access to my data again? reset password? Hi Kade, thank you for contacting us. Your password has been reset and sent to your email. My phone has the owner tag and my wifes says guest even though i logged in with the email and owners password on her device. I want to be able to create new list and as i want her to be able to creat new ones also and push and pull them. How can this happen? Can two devices have owner status? Yes, it’s possible to have owner access to the same account from different handsets. However, please be aware that only one owner account is allowed on a handset at a time. Just make sure there are no other accounts under Accounts tab before you log in to your account on your wife’s phone. Sounds nice, but what I’m really looking for is a list I can access via the web, while still being able to use the extra features on my ‘phone (such as barcode scanning). I don’t want to have to muck around with input on my ‘phone when I’m at a perfectly good computer. Unfortunately, while I’ve found some murmurings about that feature coming one day, there’s apparently no real indication for when this will be a reality. Hi Michael, thanks for your feedback. Would you like to try Mighty Grocery Basic Web UI? Instructions to access it are available on our twitter. Again, I LOVE this grocery app!!!! And now I LOVE it even more because I just figured out how to fix the problem and we are back on track!!!!! I am so glad I found this app. It makes shopping so much easier in our family. My husband and I LOVE this grocery app. 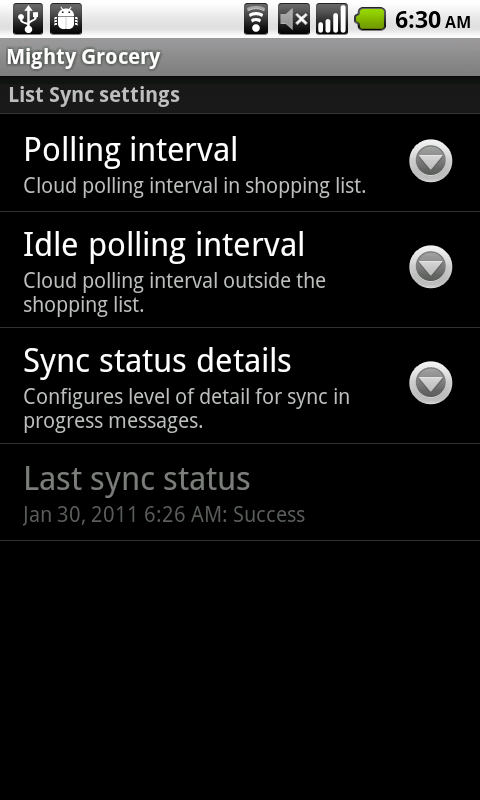 We love how it sync’s so fast. However, I had to get a new phone and it changed my account number. My husband has my old account on his phone and I have a new account on my phone and we cant seem to figure out how to get the new one on his phone or the old one back on my phone. HELP!!! Grocery shopping has been difficult ever since. Hi Deb, thank you so much for your feedback. I am glad you could resolve the issue. I have the full app and love it, however, I was wondering if there is a way to access it on a regular comp as well. If there isnt, I think there could be potential for it…thanks! Great job on the app…it was just what I wanted! Hi Jake, thanks so much for your feedback. 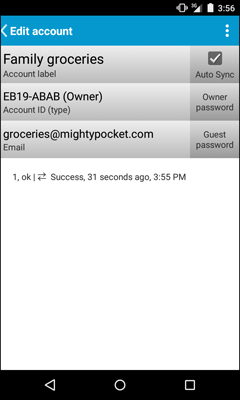 Please have a look at our Twitter to see how to access Mighty Grocery Basic Web UI. I have recently upgraded to full version. I had the lite version on my droidx. I purchased a new phone and did not import old to the new. I went to setup an account and forgot the password. My second device is a xoom and i want to sync betwenn the two. 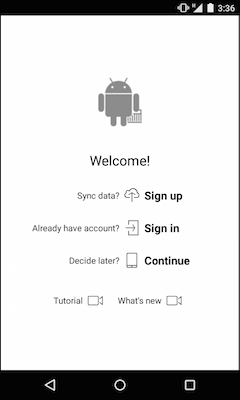 I setup an account on myphone and Now have forgottn the login. And password how do I retrievdvor get phone. Hi Angela, thanks for your question. Kindly note that you can see Account ID on the existing device by following Menu –> Settings –> Accounts –> (your account). You can also change Owner password there if you forgot your password. 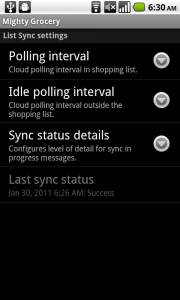 For more details about syncing handsets please see Sync with cloud User’s Guide. Server seems to be down, when I sync I get an internet connection error. There is nothing wrong with my phone, internet connection works just fine for everything else. Also the online web site for entering grocery items generates an application error when accessed. Hi Ben, sorry for the inconvenience. That was a temporary issue which has now been resolved.